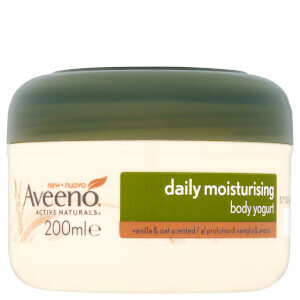 Feel perfectly pampered with Aveeno's Daily Moisturising Body Yogurt; a luxurious, quick-absorbing emulsion with a delicious Apricot and Honey fragrance. Infused with naturally active Colloidal Oatmeal and nutrient-rich Yoghurt Concentrate, the body cream delivers essential moisture and hydration for up to 48 hours. Helps to restore the skin's natural protective barrier to leave the body feeling soft, smooth and comfortable without greasy residue. Massage in to skin until absorbed. [PR-018017] Aqua, Glycerin, Distearyldimonium Chloride, Isopropyl Palmitate, Petrolatum, Cetyl Alcohol, Dimethicone, Avena Sativa Kernel Flour, Yogurt Powder, Ethylhexylglycerin, Isopropyl Alcohol, Titanium Dioxide, Lactic Acid, Hydroxyethylcellulose, Sodium Chloride, Tocopherol, Phenoxyethanol, Parfum. I love this body yogurt. It smells great and feels creamy on the skin without feeling greasy. Lovely cream aveeno is a very good make - cream absorbs well very reasonably priced I recommend it.